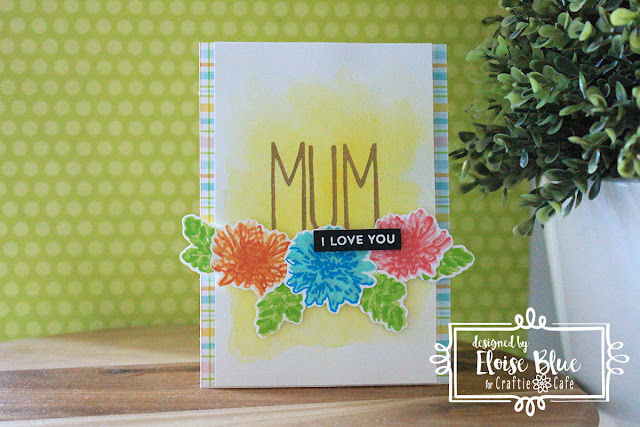 Hi everyone, today I'm here for Craftie Cafe and I have a Mother’s Day card to share with you all using the Marianne Designs Tiny Chrysanthemum’s Stamp Set along with Cutaway Alpha from Waffle Flower to create a custom sentiment. To begin my card today I first started off with stamping out my flowers. I used some Lawn Fawn Inks and stamped them up. Each flower/leaf has four layers, I decided to leave out the outline layer and just stamp all three of the layers that make up the dimension of the flower. For the orange flower I used Peach Fuzz, Fake Tan and Pumpkin Spice, the pink flower I used Ballet Slippers, Bubblegum and Guava and for the blue flower I used Merman, Mermaid and Fish Tank. For my leaves I used Celery Stick, Freshly Cut Grass and Jalapeno. These inks aren't typically layering ink sets but Lawn Fawn have released many colours and they layer up quite nicely. Once all my layers were stamped out for my flowers and leaves – they aren’t perfect, which is fine I used my fine detail cutting scissors to cut around all my images. Now that they’re cut out, I set them off to the side and worked on my background. I wanted to incorporate some yellow into the card. I took my Mijello Misson Gold Palette and water-coloured a little yellow patch in the centre of a piece of watercolour paper, making sure to blend out the edges with some water and a paper towel. I then dried it off with a heat tool and cut the panel down a little so I could have some patterned paper showing on either side. 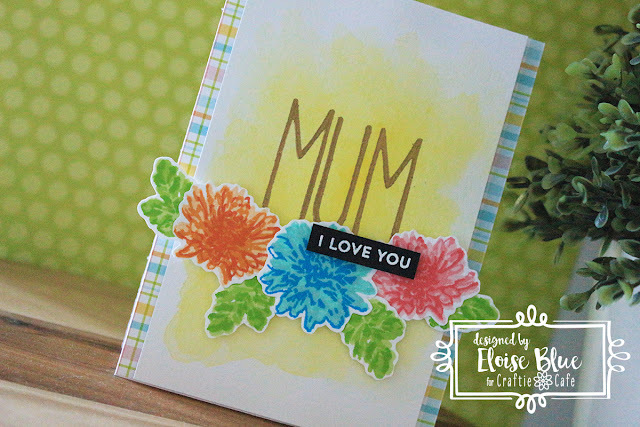 Now that my panel was cut down, I used the Cutaway Alpha set from Waffle Flower and gold heat embossed the word ‘Mum’ in the middle top of my panel. Then, I used some foam dots and popped up my flowers and leaves and adhered them in a row along the bottom of my word. To add an additional sentiment onto my card, I white heat embossed a ‘I Love You’ sentiment onto a black strip of cardstock. I then foam mounted that on top of my flowers as well. To finish off my card I used the Perfectly Plaid Spring Paper Pad from Lawn Fawn and adhered a pattern that used the same colours I did onto a white card base. I foam mounted my focal panel onto the middle of my card and that finished up my card for today. I hope you enjoyed and got inspired, be sure to check back in two weeks to see another type of card I made with this same stamp set. Thanks so much for stopping by and I’ll catch you all next time.